With 13 boats having left Sunday (June 28) on the 2,800-mile Transatlantic Race 2015, a second group of 20 is likewise due to begin the journey this Wednesday (July 1) from a staging area across from Castle Hill Lighthouse in Narragansett Bay's East Passage. It is ashore on the lighthouse's rocky perch that the New York Yacht Club's Race Committee sets itself up to sight the start (1:50 warning signal for the day's first start at 2 p.m.), and it is there and on the opposite Jamestown shore that hundreds of people turn out to wave bon voyage to the fleet and revel in the spirit of adventure that permeates the air. With the largest, fastest, most powerful boats being saved for last (their start is on Sunday, July 5), this lot - with five Class 40s, 10 IRC Racer/Cruisers and five IRC Racing entrants - will have ample muscles to flex for its own duly impressive showing. Local Volvo Ocean Race/Team Alvimedica heroes Charlie Enright and Mark Towill will sail on Bryon Ehrhart's Chicago entrant Lucky in IRC Racing class, while the world's most recognizable single-handed sailor, Sir Robin Knox-Johnston, will sail with four others on his Open 60 Grey Power in that same class. 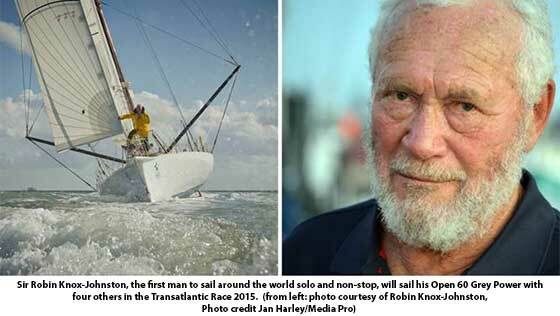 In 1969, Sir Robin became the first person to sail alone non-stop around the world. Since, he has circumnavigated the earth three more times (once on his own and twice with crew), but the 76-year-old is quick to point out that two others in his crew have sailed around the world singlehanded as well: India's Dilip Donde and France's Bernard Gallay. "If you include me, that's 60 percent of our crew and 1 ½ percent of the 200 people in the world who've ever done it," he said, adding that, by comparison, 680 people have gone into space. Filling the final two Grey Power crew spots are Monaco's Joshua Warren and the UK's David Aisher, who happens to be the Commodore of the Royal Ocean Racing Club, one of the event's four hosts. (Royal Yacht Squadron, New York Yacht Club and Storm Trysail Club are the others.) While many boats will sail with 12-15 crew members, Sir Robin, who sailed Grey Power to third in last November's 3,542 mile single-handed Transatlantic Route du Rhum, says five won't leave him shorthanded. "The boat is designed for one person so I think we'll manage to do all right (laughs),"he said, "but we aren't expecting to win overall. We have a terrible rating. If Rambler 88 (a boat in the third start trying to break the race record) crosses in 6 ½ days, we have to do it in eight - that just isn't going to happen. The priority is to get across safely, and after that, as fast as we can." 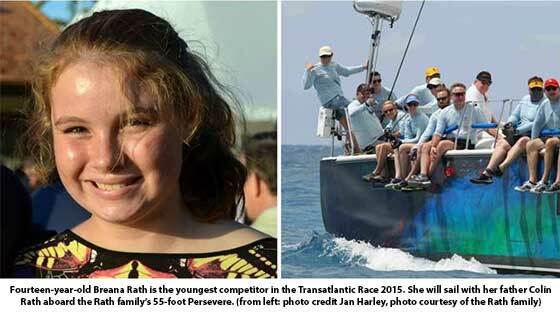 Meeting Sir Robin at registration was a thrill for the youngest sailor in the fleet, 14-year-old Breana Rath, who will sail with her father Colin Rath and 12 others aboard her family's cruising boat Persevere in IRC Racer/Cruiser class. She has lived on the boat with her family (including mom, twin sisters, a dog and a cat) since October of last year and "bounced around the Caribbean for seven months" before coming to Newport. About racing across the Atlantic, she said, "I'm mostly nervous about doing well with all these professional sailors and keeping my part up, because I know I just want to be equal with everyone else." She explained that she handles the running back stays on the boat, because "I'm strong with upper body muscles, and no one else wants to do it." "I think that's great," said Sir Robin to Breana, "and I give full marks to Dad for taking you. You'll get an experience you'll never forget and I expect you'll be back for more." Also up for the adventure is the father/son combination aboard Jinja. Since it is a cruising version of the racier Class 40s that have their own start on Wednesday, Jinja will sail in IRC Racing Class with an all-British crew led by Ian Matthews. His two sons, Alex and Rupert, and his son-in-law, Jonathan Russell, will be part of Jinja's six-person crew. "I'm a bit nervous...anxious...excited...I've done the ARC (Atlantic Rally for Cruisers) but never a transatlantic passage like this," said the elder Matthews. The second start of the Transatlantic Race 2015 also will showcase two German boats, both with well-known German sailors aboard. Burkhard Keese's Class 40 Stella Nova features Jorg Riechers, his country's most accomplished single-handed and double-handed sailor, and IRC Racing class entrant Outsider features Tilmar Hansen and Thomas Jungblut as Admiral's Cup and Maxi Worlds veterans. Both boats are in it to win it. "The race is cool, it's tough," said Riechers, "and it's a good thing for my offshore career, because experience is important." Jungblut said Outsider is built for long-distance racing, and his team has every chance to win in class as well as overall. "That is not only a wish, but our goal," he said. Jose Diego-Arozamena's Spanish entrant Maximizer also has some accomplished sailors who are countrymen aboard, incuding skipper Bachi Riberio and Gerard Marin, both known for their Barcelona World Race campaigns. Also among Maximizer's 12 crew members are Spain's 1992 470 Olympic Gold Medalist Francisco Sanchez Luna and J/80 World champion Juan Gonzales. "If we have a good race, we'd like to podium, but if not, it's just nice that we are doing the race," said Riberio.